This is a new replacement center console mounted oil pressure gauge FACE PLATE for use on 1968 1969 Camaro models with console mounted gauge package. This is a new replacement center console mounted oil pressure gauge silver FACE PLATE for use on 1968 - 1969 Camaro models with console mounted gauge package. 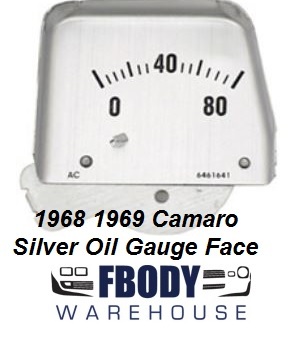 Replace faded original console oil gauge face, incorrect small text Delco replacements, or flat finish gauge face found on some reproduction gauges with these correct brushed finish, silver face reproductions with original bold text and indicator line appearance.